The cafeteria is managed by Mr Abdel Mouthar, under Mr Didier Delhoux' supervision, the canteen manager. Mr Mouthar is helped by Mrs Mei Lin Ma. A supervisor is looking over the cafeteria everyday from 10:45 to 13:45 (on Wednesday until 11:45). 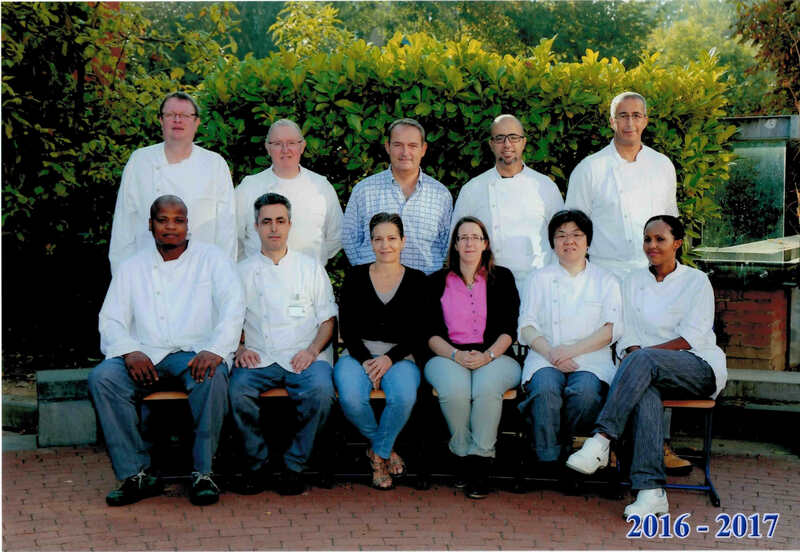 October 2016: canteen and cafeteria team, with Jean-François, Pascal, Didier, Youssef, Abdel, and Barry, Mohamed, Anna, Nathalie, Mei Lin, Fifi. The access to the cafeteria is reserved for students of the secondary cycle. The cafeteria is managed by the Canteen Committee, jointly by the APEEE and the school. Students can always give suggestions and remarks about this place, created for them. Please contact the Students Committee or the canteen office (by tel. 02/211.4005 ou 02/211.4006 or by e-mail cantine@apeeeb3.be).